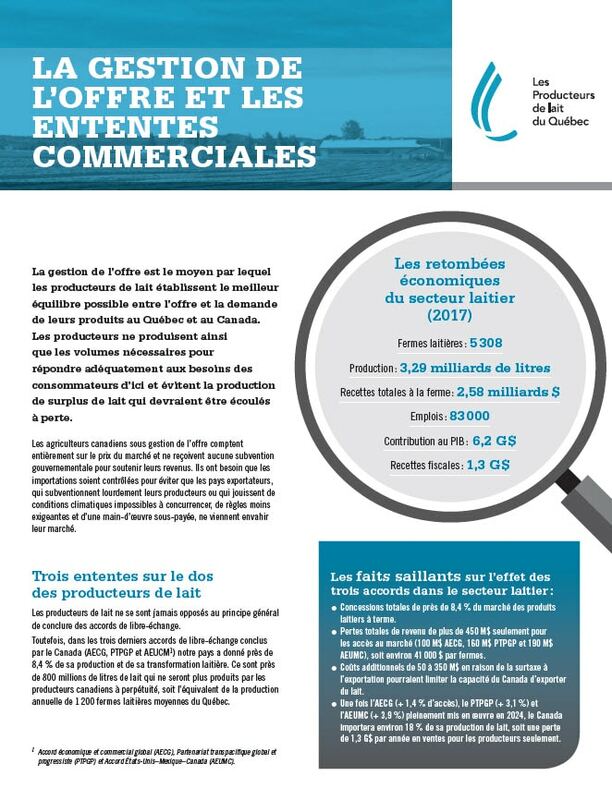 Did you know that a single cow, in a 305-day production cycle, can give enough milk to meet the annual milk and dairy products needs of 100 people? The volume of milk produced by the cow depends on her genetic characteristics, breed and physical condition. It may also vary according to the quantity and quality of pasture, fodder or grain fed to the cow. 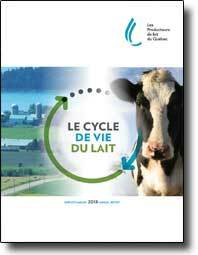 An average Quebec cow produces more than 8,000 litres of milk a year. Food in the cow’s mouth is masticated a first time to reduce the length of grass or hay. When she eats, the cow chews very little and swallows her food almost whole. The cow has no upper incisors. When she grazes, she doesn’t cut the grass with her teeth, but pulls on it to tear it. Cows can be fed with field grass and silage composed of alfalfa, millet and corn. Silage is a conservation process that allows the food to ferment, providing it with added nutritional value. Cows also eat mineral or soybean-based mashes and grains such as barley. 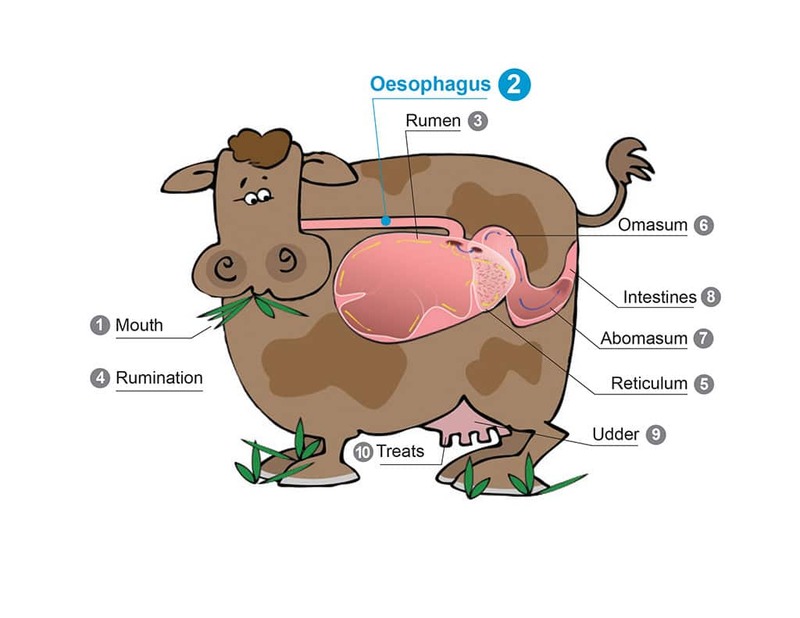 The food then passes through the oesophagus to the first compartment, the rumen. This is the compartment with the biggest reservoir and the most important role. This is where the fodder and grain ferment. These foods could not be transformed by another mammal’s stomach and absorbed by its blood. The bacteria in the rumen are what make the difference in cows. They partially transform foods into substances that the cow’s digestive system can use. Food stays in the rumen for 24 to 48 hours. The foods that the cow consumes often consist of long particles that are too big for the rumen’s bacteria to digest them completely. The cow therefore regurgitates them to chew them several times until the particles are small enough. The cow is then said to be ruminating, or chewing her cud. Saliva also plays a major role because it furnishes elements used by the rumen’s bacteria. During rumination, saliva production can reach 250 to 300 ml/min or 1 litre every 3 to 4 minutes. Saliva production in cows exceeds 200 litres per day. A cow can chew 50 to 70 times per minute for 10 to 12 hours per day, or 40,000 to 45,000 jaw movements per day. Once the bacteria in the rumen have done their job, the food is directed to the reticulum, the smallest stomach. This ensures the continuity of fermentation and serves as a sort of sieve, retaining particles that are too long in the rumen, while allowing the small particles to continue their journey to the omasum. The retained particles will be regurgitated to be chewed again (rumination). The omasum performs additional fermentation and retains part of the water impregnating the foods in the first two compartments. This compartment of the cow’s stomach corresponds to the stomach of non-ruminants. This is where digestion as such begins. Finally, the food enters the intestines to complete the digestive process and the resulting nutrients are absorbed. The udder is the mammary organ that secretes the cow’s milk. The nutrients absorbed by the blood during the different stages of digestion are channeled into the udder’s mammary glands, where the components of milk are synthesized. For each litre of milk produced, 500 litres of blood enter the udder. The four teats allow the calf to suckle and the farmer to milk the cow.